Usually, I run from needles. The idea of something sharp sliding through anyone’s flesh is enough to make me feel a little less steady on my feet. But yesterday, I walked willingly through the country’s epicenter of all things sharp, spikey and barbed and I actually watched as men pierced each other’s chest, back, arms, tongue and head. Yesterday was Thaipusam, the Hindu festival of devotion, prayers and penance. (Thai = the name of the month on the Tamil calendar, and Pusam = the name of a star, which is at its highest point during the festival). Hindus dedicate the festival to Lord Murugan, their deity of youth, power and virtue. I took a Grab ride to Singapore’s Little India with some of my new neighbors and friends, and as soon as I stepped out of the car, I smelled incense. The aroma thickened as we walked closer to the gate of the Sri Perumal Temple, and the steady sound of beating drums grew louder. At the gate, we took our shoes off out of respect and left them next to all of the other shoes. It felt funny to leave my shoes on the street and walk around barefoot in an area filled with skewers and needles, but the only thing I stepped on that I wished I hadn’t were some berries. Along with the no-shoes-inside-the-temple rule, we also had to cover our knees and shoulders. Most of us wore capris, and one lady in our group wore shorts, but she covered her knees by tying a sweatshirt around her waist. And not only were cameras allowed, they were welcomed. Both visitors and the family and friends of the devotees were taking pictures. Inside the temple, hundreds of devotees and their family and friends worked to assemble colorful, elaborately decorated kavadis. Most kavadis were decorated with flowers, beads, peacock feathers, and pictures of deities. Pots of milk were attached to the end of the kavadis’ poles. And these kavadis are not cheap. Many of them cost thousands of dollars! Kavadis, which weigh around 80kg (more than both of my kids combined! ), are slung over a devotee’s shoulders and strapped around their waist. 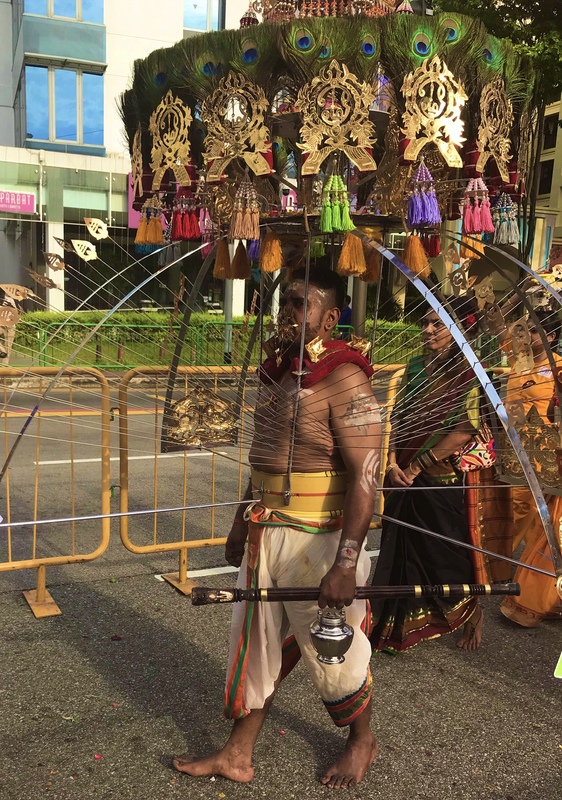 And here’s the part that blew my mind: the kavadi is also connected to each devotee via dozens of hooks, spears and skewers. Men surrounded each devotee as they pierced their chest, back and arms, and some even pierced their tongue, head and cheeks. Most of the devotees remained stoic during the piercings. Only a few of them winced or looked uncomfortable. 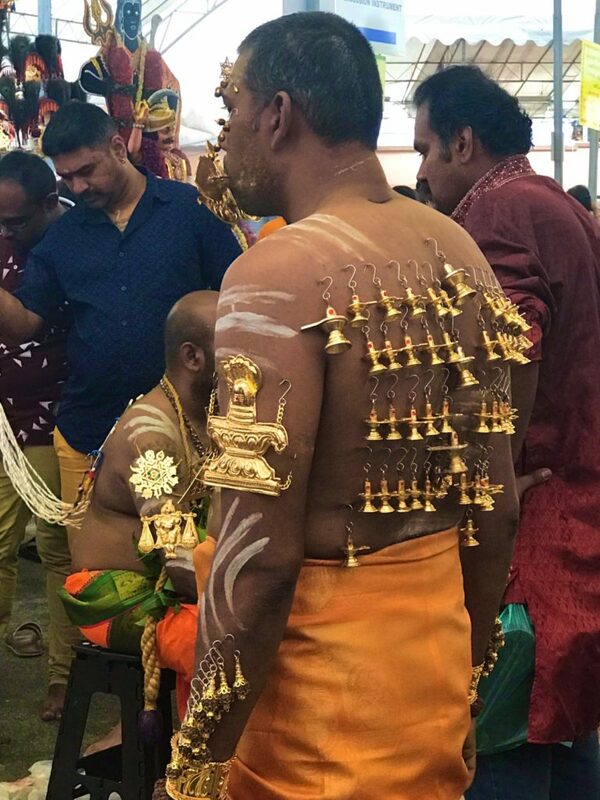 After each devotee completed his piercing, he started dancing to the loud, rhythmic music, which was supposed to put him in a trance before their painful 4 km procession to the Sri Thendayuthapani Temple. Although the processions began shortly after midnight, the bands were only allowed to use drums after 7 a.m. due to Singaporean music ordinances. After each devotee danced for several minutes, they slowly walked out of the temple with their entourage of family and friends. Although only men carried kavadis, women carried jars of fruit and grains as offerings. 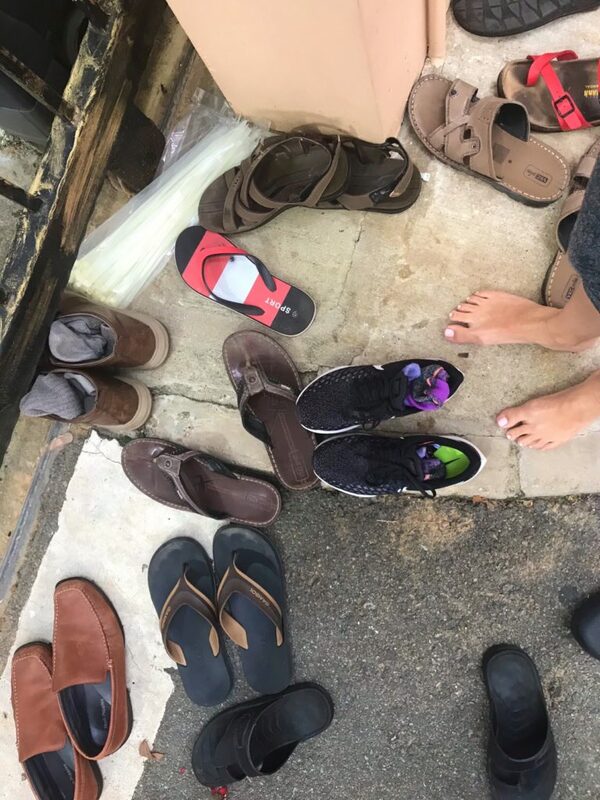 We grabbed our shoes from the temple gates and put them on, then walked along the streets to watch the devotees. It reminded me of a marathon, with onlookers standing along the street to watch them. I wanted to cheer them on as you would in a race, but no other bystanders were cheering. The devotees’ entourage chanted and played music as they walked, which probably helped them. Most men carried arched kavadis attached with spears and hooks, but we also saw several men walking on shoes made of nails. They walked extremely slowly, and with the help of a cane. We saw another man who was pulling a chariot with chains connected to the hooks in his back. 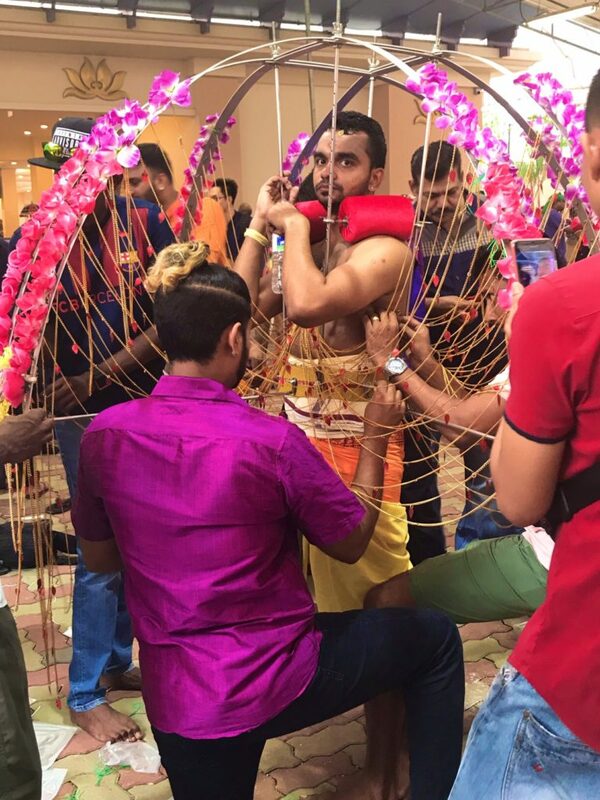 I learned that the procession and the carrying of the kavadi is only part of each devotee’s vows and purification ritual. They begin preparing for Thaipusam weeks ahead through fasting and abstinence. Some begin as early as 45 days before! 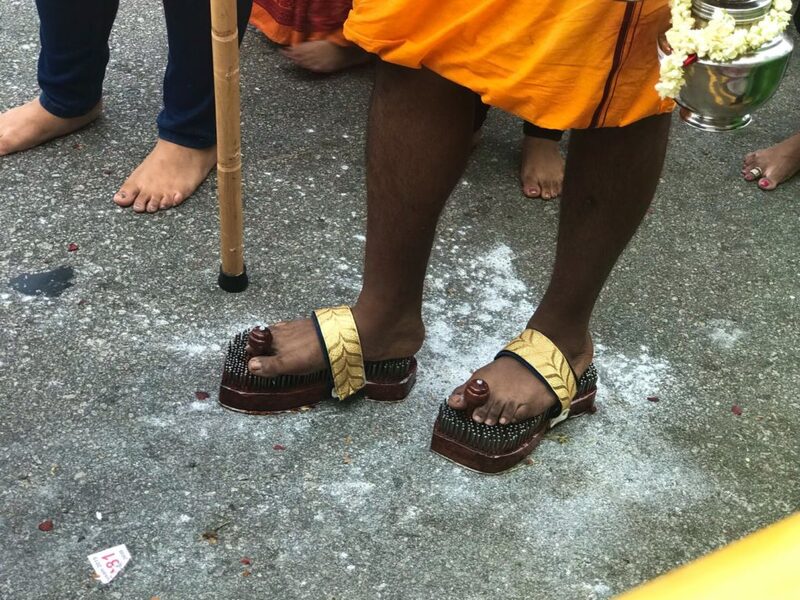 Although I am Catholic, and I don’t fully understand the religious significance of Thaipusam, I am grateful I was able to attend the festival to watch how other people of other faiths practice devotion, penance and sacrifice. When we first walked into the temple, I felt like a nosy outside and I hid my camera in my pocket. But after being greeted with smile after smile, I realized they really did welcome visitors to their celebration. This festival would be a golden sponsorship opportunity for Neosporin and BandAid. I am a wimp because I hate flu shots. This festival takes devotion to the extreme. Although I don’t completely understand it, I admire their faith tremendously. Anyone who has the chance to attend this festival should. I should probably never complain about a paper cut again. Hi there! Thanks for stopping by. 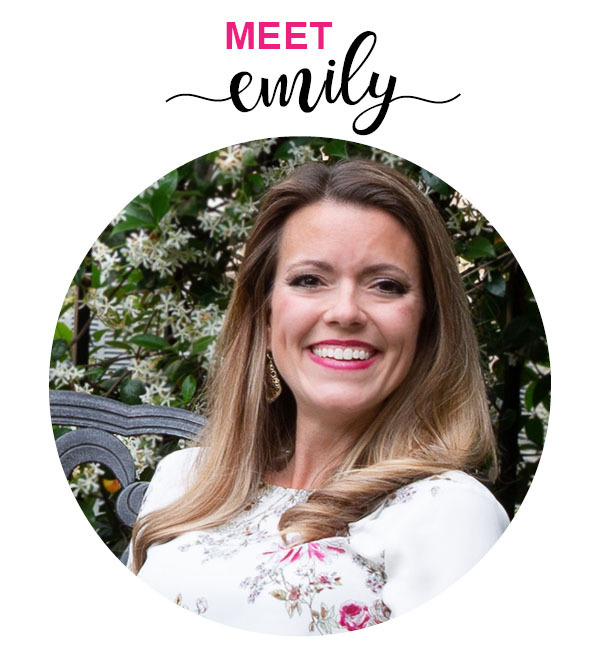 I'm Emily, and I'm a writer, blogger, and book clubber. Need some fun ideas for your next book club meeting? You’ll find plenty on the Book Club HQ page. Want to laugh about the sugar and spice of everyday life? Be sure to check out my blog. Happy reading!